Firstly Ignore the mushroom and pepper sauce, I always serve this with this incredible vegetarian gravy. Even the meat eaters ask for this gravy, not meat gravy. 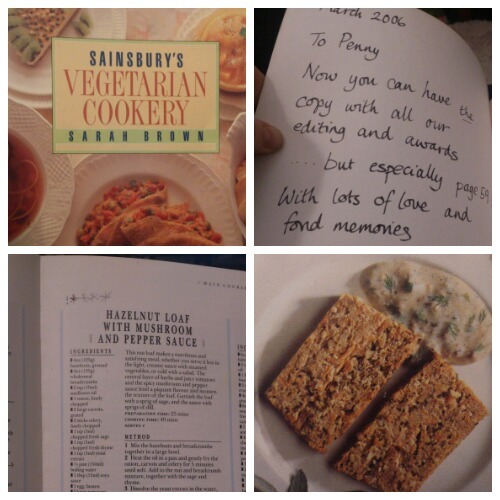 This is a special recipe that my mum always served and that’s her inscription in the front of the book. All credit to Sarah Brown here, we tweak it each year, sometimes using cashews for a softer, less nutty roast, or basil with the tomatoes, but it always says ‘Christmas’ to me. The day after the nut roast and gravy gets mixed together with leftover veggies in a Boxing Day Pasty. I’ve shared the recipe below. Nut roast gets a bad name in the world of veggie food, I am afraid supermarkets have made some seriously bad imitations, but it really is just like a very special stuffing, even the meat eaters in my family love it. It should be moist, not dry and full of herby flavour. It is best when the nuts blend in, rather than with big chunks of nut. I’ve spotted two more really lovely nut roast recipes over at the Brighthouse Christmas kitchen: Parsnip and Apricot Roast and Cranberry and Chestnut Roast. I love the fact both have Wensleydale cheese in, perfect fruit and cheese combo! Click the picture below to go to the Brighthouse Kitchen, then click on the festive food icon on the cooker, scroll past the Beef Pate and Snowman Canapes and there they are. 3. Mix the hazel nuts and breadcrumbs into the vegetable mixture. 4. Dissolve the marmite and soy sauce in the water and add to the other ingredients. 5. Beat the egg and add. 6. Put half the mix in the loaf tin. 7. Layer with the tomatoes and parsley. 8. Top with the other half of the mix and cook at 350/180/Gas 4 for 35-40 minutes. This recipe and many more amazing Christmas family activities by some of the UK’s finest parenting bloggers are featured in a wonderful eBook to honour our blogging friend Kerry who died this time last year. Happy Christmas! If you try these nut roast recipes do let me know how you got on.